MESSAGE SUMMARY: Surprise – Jesus is Not Dead; Jesus Is Alive to All Who Accept Him in Faith Surprise effects people in different ways. When Mary Magdalene entered Jesus’ tomb looking for Jesus after His crucifixion and death, she was surprised in John 20:15-16: “Jesus said to her, ‘Woman, why are you weeping? Whom are you seeking?’ Supposing him to be the gardener, she said to him, ‘Sir, if you have carried him away, tell me where you have laid him, and I will take him away.’ Jesus said to her, ‘Mary.’ She turned and said to him in Aramaic,  ‘Rabboni!’ (which means Teacher).". Jesus was dead, but He did not remain dead. Through Jesus resurrection, He arose from the dead as was seen after the resurrection by Mary Magdalene, the Apostles, and many others over the forty-day period until His Ascension – all were surprised when they saw Jesus alive after His death on the cross. Today, two thousand years later, many people are surprised to learn that Jesus is not dead. It is not until we come to Jesus in personal faith that we realize that Jesus is alive – our realization of Jesus immortality is not from an intellectual awareness, but our realization of a living Jesus comes through a personal, experiential faith-based relationship with Jesus in our lives. Evil and sin are all around us sinners; and as Paul tells us in Romans 6:23 – “For the wages of sin is death, but the free gift of God is eternal life in Christ Jesus our Lord.". Therefore, without a living Jesus, our eternal death is the only outcome. Also, societies attempting to function without a living Jesus are on a pathway to “pure evil”. Easter changed all this for us who come to Christ and follow Him. Jesus is alive for us. For those of us who believe in Jesus, things happen to us personally in our lives: 1) our sins are forgiven – part of Jesus’ resurrection is the power we are given over our sins and sinful nature, as Jesus tells us in Matthew 26:28: “for this is my blood of the covenant, which is poured out for many for the forgiveness of sins.”, some of us are surprised that our sins are forgiven with our faith but without our performance of some “works”; 2) eternal life is made available to us – having a personal relationship with God for eternity is eternal life; and 3) Jesus is with us in the surprises that life throws our way – we have to come to Jesus in repentance and faith, however, too many of us live our lives as if we believe that Jesus is dead. Christ is risen! Is Jesus resurrection a surprise to you? If so, ask Jesus, through your faith, to come into your life right now; let a living Jesus and not the twists and turns of your life surprise you. TODAY’S AFFIRMATION: I affirm that because of what God has done for me in His Son, Jesus, I AM RIGHTEOUS IN GOD’S EYES. God made Him who had no sin to be sin for us, so that in Him we might become the righteousness of God. (2 Corinthians 5:21). 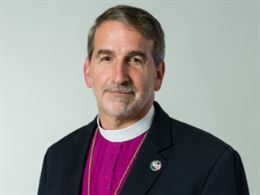 WEBSITE LINK TO DR. BEACH’S EASTER VIDEO – “Easter -- I Am the Resurrection – (Holy Cross Anglican Cathedral; Loganville, GA)”: www.AWFTL.org/watch. A WORD FROM THE LORD WEBSITE: www.AWFTL.org. DONATE TO AWFTL: https://mygiving.secure.force.com/GXDonateNow?id=a0Ui000000DglsqEAB SCRIPTURE REFERENCE (ESV): John 20:11-18; Romans 6:20-23; John 20:1-10; Luke 24; Acts 10:39; 1 John 2:1-2; 1 Corinthians 15:16-19; 2 Corinthians 5:21; Psalms 103:12; John 17:3; John 3:36; 1 John 5:11; Hebrews 13:8; Hebrews 13:5. Articles by Archbishop Foley Beach Check out articles written by Archbishop Foley Beach.